Synthetic peptide within Human Dnmt1 aa 1500-1600. The exact sequence is proprietary. WB: HEK-293, Jurkat, HeLa, Neuro-2a and NIH/3T3 whole cell lysates. IHC-P: Human placenta, mouse stomach and rat stomach tissues. ICC/IF: Wild-type HAP1, HeLa, 293T and Neuro-2a cells. Our Abpromise guarantee covers the use of ab188453 in the following tested applications. WB 1/1000. Detects a band of approximately 183 kDa (predicted molecular weight: 183 kDa). Lanes 1 - 2: Merged signal (red and green). Green - ab188453 observed at 183 kDa. Red - loading control, ab8245, observed at 37 kDa. ab188453 was shown to specifically react with DNMT1 when DNMT1 knockout samples were used. Wild-type and DNMT1 knockout samples were subjected to SDS-PAGE. Ab188453 and ab8245 (Mouse anti GAPDH loading control) were incubated overnight at 4°C at a 1/1000 dilution and 1/10000 dilution respectively. Blots were developed with Goat anti-Rabbit IgG H&L (IRDye® 800CW) preabsorbed (ab216773) and Goat anti-Mouse IgG H&L (IRDye® 680RD) preabsorbed (ab216776) secondary antibodies at 1/10000 dilution for 1 hour at room temperature before imaging. ab188453 staining Dnmt1 in wild-type HAP1 cells (top panel) and DNMT1 knockout HAP1 cells (bottom panel). The cells were fixed with 4% formaldehyde (10min), permeabilized with 0.1% Triton X-100 for 5 minutes and then blocked with 1% BSA/10% normal goat serum/0.3M glycine in 0.1% PBS-Tween for 1h. The cells were then incubated with ab188453 at 1μg/ml and ab195889 at 1/250 dilution (shown in pseudocolour red) overnight at +4°C, followed by a further incubation at room temperature for 1h with a goat secondary antibody to Rabbit IgG (Alexa Fluor® 488) (ab150081) at 2 μg/ml (shown in green). Nuclear DNA was labelled in blue with DAPI. Immunofluorescent analysis of 4% paraformaldehyde-fixed, 0.1% Triton X-100 permeabilized Neuro-2a (Mouse neuroblastoma cell line) cells labeling Dnmt1 with ab188453 at 1/2000 dilution, followed by Goat Anti-Rabbit IgG H&L (Alexa Fluor® 488) (ab150077) secondary antibody at 1/1000 dilution (green). Confocal image showing nuclear staining on Neuro-2a cell line. The nuclear counter stain is DAPI (blue). -ve control 1: ab188453 at 1/2000 dilution followed by Goat Anti-Mouse IgG H&L (Alexa Fluor® 594) (ab150120) secondary antibody at 1/1000 dilution. -ve control 2: Anti-alpha Tubulin mouse MAb (ab7291) at 1/1000 dilution followed by Goat Anti-Rabbit IgG H&L (Alexa Fluor® 488) (ab150077) secondary antibody at 1/1000 dilution. Flow cytometry analysis of HeLa (human cervix adenocarcinoma) cells labeling with purified ab188453 at 1/100 dilution (10ug/ml) (Red). Cells were fixed with 4% paraformaldehyde and permeabilised with 90% methanol. A Goat anti rabbit IgG (Alexa Fluor® 488)(ab150077) )(1/2000 dilution) was used as the secondary antibody. 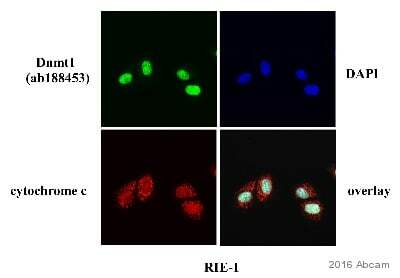 Rabbit monoclonal IgG (Black)(ab172730) was used as a isotype control.Cell without incubation with primary antibody and secondary antibody (Blue) were used as unlabeled control. Immunohistochemical analysis of paraffin-embedded human placenta tissue labeling Dnmt1 with ab188453 at 1/100 dilution, followed by Goat Anti-Rabbit IgG H&L (HRP) (ab97051) at 1/500 dilution. 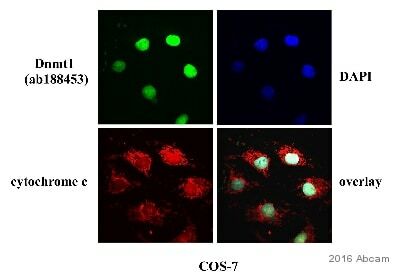 Nuclear staining on human placenta is observed. Counter stained with Hematoxylin. Immunohistochemical analysis of paraffin-embedded mouse stomach tissue labeling Dnmt1 with ab188453 at 1/100 dilution, followed by Goat Anti-Rabbit IgG H&L (HRP) (ab97051) at 1/500 dilution. Nuclear staining on mouse stomach is observed. Counter stained with Hematoxylin. Immunofluorescent analysis of 4% paraformaldehyde-fixed, 0.1% Triton X-100 permeabilized HeLa (Human epithelial cell line from cervix adenocarcinoma) cells labeling Dnmt1 with ab188453 at 1/2000 dilution, followed by Goat Anti-Rabbit IgG H&L (Alexa Fluor® 488) (ab150077) secondary antibody at 1/1000 dilution (green). Confocal image showing nuclear staining on HeLa cell line. The nuclear counter stain is DAPI (blue). Immunohistochemical analysis of paraffin-embedded rat stomach tissue labeling Dnmt1 with ab188453 at 1/100 dilution, followed by Goat Anti-Rabbit IgG H&L (HRP) (ab97051) at 1/500 dilution. Nuclear staining on rat stomach is observed. Counter stained with Hematoxylin. Immunofluorescent analysis of 4% paraformaldehyde-fixed, 0.1% Triton X-100 permeabilized HEK-293 (Human epithelial cell line from embryonic kidney) cells labeling Dnmt1 with ab188453 at 1/2000 dilution, followed by Goat Anti-Rabbit IgG H&L (Alexa Fluor® 488) (ab150077) secondary antibody at 1/1000 dilution (green). Confocal image showing nuclear staining on HEK-293 cell line. The nuclear counter stain is DAPI (blue).